Back Key lets you return to the previous screen, or close a dialog box, options menu, the Notifications panel, or onscreen keyboard. Speaker lets you hear the different ringtones and sounds. The speaker also lets you hear the caller‟s voice in speakerphone mode. Menu Key allows you to access the options available for the current app, feature, function, or screen. Home Button returns you to the Home screen. Press and hold to open the recently-used applications window. Front-Facing Camera Lens takes pictures and records videos while facing the screen, and allows you to video conference. Proximity Sensor detects how close an object is to the surface of the screen. This is typically used to detect when your face is pressed up against the screen, such as during a phone call. 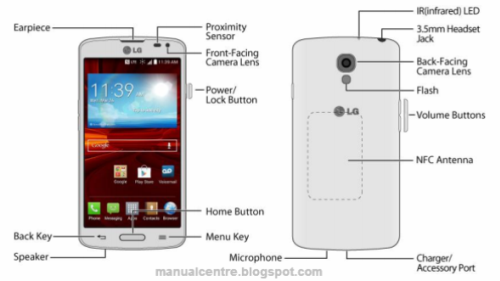 While talking on the phone, the sensor detects talk activity and locks the keypad to prevent accidental keypresses. NFC Antenna allows you to use features such as NFC and Android Beam to send and receive data wirelessly. Volume Buttons allows you to adjust the ringtone or media volume or adjust the voice volume during a call. Back-Facing Camera Lens lets you take pictures and videos. IR (infrared) LED allows you to use the QuickRemote app to control your TV and cable box.